What makes mobile devices so popular today? They are super portable, can be turned on instantly, let users multi-task, are cross-platform, and have great battery life. So when it comes to social communications, what do these same users want? They want the same benefits that mobile devices offer and more. Introducing Palringo, a mobile group messaging app that lets users send instant text, share instant pics, and leave instant voice messages. Palringo can even turn your phone into an instant walkie-talkie. Never miss an update or message with push notifications. The always-on feature lets users multi-task and receive messages, even when the app is not running. The power-saver mode doesn’t drain the phone’s batter. Palringo is a free cross-platform app and works with all major mobile devices – even PCs and Macs. 12 million fans around the world are embracing Palringo and sending billions of messages a month within 300,000+ groups. The rapidly-growing community of Palringo Groups covers every type of interest area, from gaming and entertainment to sports, technology and business. Groups can be made private or public and can accommodate up to 2,000 members. The Palringo gaming community is the most popular and includes more than tens of thousands of groups focused on gaming, with hundreds of thousands of active users. More than 33 percent of these gamers focus on RPGs (Role Playing Games) such as iMobsters. 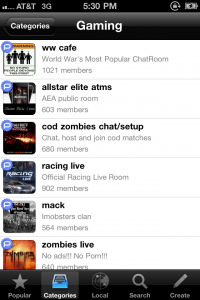 The next largest segment, at 23 percent, focus on creating clans for games such as Call of Duty: Black Ops. Because of Palringo’s rich functionality, gamers can use the platform to communicate during the game; collaborate during competitions; arrange game-based contests; and have an instant, mobile and interactive forum to share tips, experiences and information during gameplay. With Palringo, gaming enthusiasts have found a way to communicate interactively, outside the gaming application and the platform has become a key aspect of the active communities that surround specific games and wider game genres. Send unlimited free text messages to your contacts or groups. Voice message one person or a group of people instantly. Enable Push-to-Talk and turn your phone into a walkie-talkie. Set your voice messages to play instantly or re-play your messages at a later time. Snap a pic and share it instantly with a friend or within a group conversation. The only cross-platform mobile community that allows groups to scale up to 2,000 members. Search for groups by category, interest, popularity, location, and keywords. Share your location with friend or people in your group. 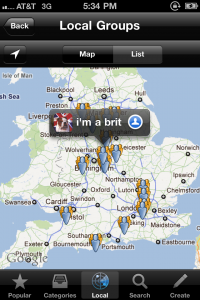 The geotagging feature helps you find groups and people based on proximity and geographical location. Never miss an update or conversation with push notifications. The battery saver mode allows you to receive messages for 24 hours, even when the app is not running. Chat with anyone, anywhere, on any device, or network. Palringo uses your data connection so you can send unlimited text, pictures, voice messages without paying any additional SMS charges. Users can easily chat with their friends who use services like Windows Live Messenger ® (MSN), AOL ® Instant Messenger (AIM), Yahoo! ® Messenger, Google Talk ™, ICQ ®, Jabber ®, iChat® / MobileMe ®, Gadu-Gadu ® and Facebook Chat. The app is available for iPhone, Android, Windows Mobile, Symbian, Java, PC and Mac.